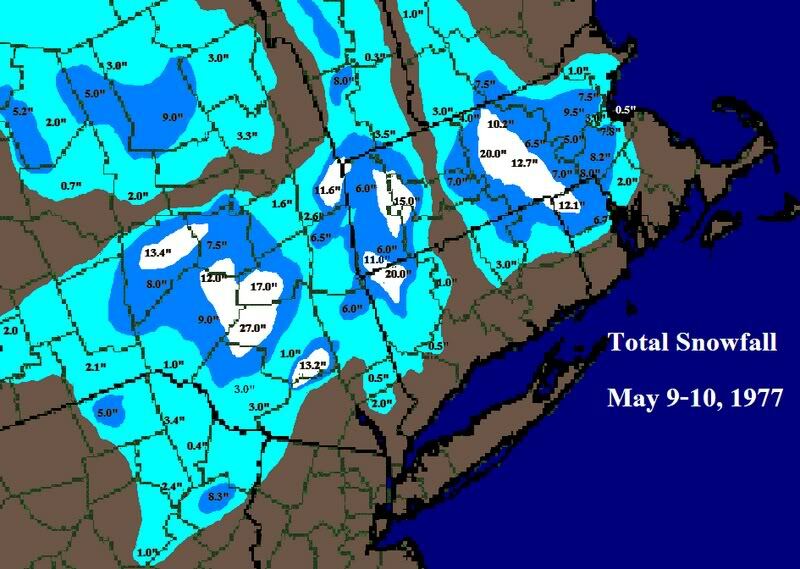 40 Years Ago: Massachusetts Snags a Memorable Snowfall in May Storm | Watts Up With That? I’ve posted three times this year on historic snow storms of March and April. By the time May rolls in, it’s really tough to get a snowflake in southern New England. 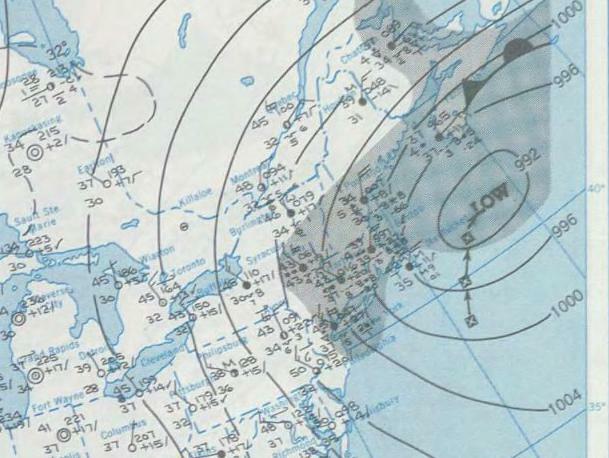 However, occasionally New England manages to find a way and outdid itself 40 years ago on May 9th. A small low pressure system dropped down from Hudson’s Bay with a large high pressure system just behind. While the associated cold front pushed down to the Gulf of Mexico, the upper level trough became a cutoff low over southern New England Together, they managed to bring near freezing weather to where I lived in eastern Massachusetts. An offshore surface storm formed, intensified, and backed into New England bringing Atlantic moisture with it. Heavy snow aloft chilled the surface air and changed rain to heavy wet snow. That quickly overwhelmed the warm soil temperatures and brought the region some 8″ (20 cm) of snow on the ground. I measured 3″ (8 cm) of snow on the sides of utility poles. More significantly, deciduous trees like maples had leafed out and the weight of the wet snow brought limbs and whole trees down, often on power lines. 600,000 customers lost power, some for a week. News anchor Shelby Scott at WBZ-TV begged people to feed the birds as the ground feeders couldn’t reach the ground until the snow melted. While maps show little snow accumulation along the coast, I recall that even there they had tremendous tree damage. Higher elevations to the west, e.g. Worcester, the Berkshires, and the Catskills in New York had 1-2 feet (30-60 cm). By some measures, this was a 200-300 year storm. “Unprecedented” was heard many times that week. This event, previous events, and subsequent events, fit in well with general handwringing then about an impending ice age. Magazines like Time, Newsweek, and Science News had significant reports citing the evidence of the cooling climate since the 1950s. While people who belittle these concerns point to there being few peer reviewed papers on the subject, climatology had only recently transformed from documenting climatic history to making hypotheses about future climate. People saw a very scary trend, but didn’t have a good culprit beyond aerosols caused by air pollution. David Keeling at Scripps Institution of Oceanography published a paper the year before showing his record of CO2 levels at Mauna Loa. This established both the seasonal oscillation and a monotonic rise in annual CO2 levels. This had been hinted at in a 1960 paper, but now with 14 years of very clean data, his graph was sensational news and his paper helped shift scientists’ focus to CO2 levels as a climate driver, especially a few years later as the climate flipped back to a warming mode. However, before that happened, our impending ice age was clear to everyone in the northeast. Severe cold earlier in the 1976/1977 winter brought a protracted freeze that shut down barge traffic on the Ohio River, froze Lake Erie early, and in January had set the conditions for a paralyzing blizzard in Buffalo. I wish I had written about it in January. This May storm added more fuel to the fire. Or snow to the ice chest. Spring did get back on track after this storm, but eight months later Boston would set, briefly, a new record for the greatest 24 hour snowfall. (Think about what that means!) I expect to write two or three posts about the winter of 1977/1978, as the worst was yet to come before the warming climate of the 1980s and 1990s took hold. May 8, 2017 in History. ← Awkward moment: Are Microbiologists Climate-Denying Science Haters? He built up an extensive and informative web site that I hope will be around for the indefinite future. I can still recall the flowering fruit trees in Bedford and Concord with partial layers of snow that exposed horizontal patches of pink . It was a reminder that nature can be both very lovely and quite startling in its unexpected combinations. But the absence of a snow storm in Massachusetts this year must be a proof of man-made-global warming! Weather Bell Joe Bastardi is forecasting a “nasty” Mother’s Day nor’easter for this coming Sunday in New England. Probably too warm for snow, but still cold and nasty. Nebraska and South Dakota had them a couple of years in a row…we had 7″ and more of May snow in Iowa in 2013. Seems to me that winters are getting longer. I recall we had about the deepest snowfall in my memory in eastern Oklahoma around that time. About that time, I recall pulling together materials regarding cold periods, namely, that such times resulted in more storms in the mid-latitudes. I do not recall thinking the climate was changing. Then, as now, I do not think a small amount of warming or cooling actually changes the climate of a place. My basis for climate includes vegetation boundaries and transitions – ecotones. Early Köppen climate classes were of this sort. A very good point, that you hardly ever see mentioned. A turning point of sorts. The people who insist that the scientific community did not have have concerns about a cooling climate base that solely on the published papers. It’s almost as though they refused to look at the empirical data. While my connection was largely through my sister’s Phd work at the Marine Biological Laboratory on Cape Cod, I suspect Keeling’s graph gave people some solid data and was a big relief to them. That was enough for them to blame the cold on human activity. “Unprecedented”. Now where, oh where, have I heard that term before? Forty years ago is the new now, meridionally speaking. It just goes to show that throughout time, there is always outliers in early killer frosts, or late spring snow storms. I learned from my grand parents who were all born in the early 1890’s, that by the end of their lifetimes, they too had seen all the wacky weather that we will always probably get. If you were a farmer as many were 100 years ago, expect the worst and hope for the best. I don’t know if anyone watched Fareed Zakaria on his program GPS Sunday morning, but he had two guests of recent import on. The first was Bret Stephens in a political panel and at the end of the segment, Fareed politely asked Bret Stephens about his recent article in the New York Times regarding his ‘heretical’ article on AGW/climate change. Bret was saying that his fear was ‘intellectual hubris’ by leading climate scientists may be similar to the political campaign of HRC and that they risked missing the trees for the forest in properly understanding AGW/climate change. To his credit at the end of the segment, Fareed basically said it was a valuable contribution to the climate change debate and immensely enjoyed his NYT article. The final guest was Neil deGrasse Dyson, pontificating on science and particularly climate change. Near the end of his talking points, NDG said that if anyone even questioned the ‘theory’ of climate change, that it was the beginning of the end for our democracy and ignorant jackals like us who elected a denier, well you know how the rest of that goes. Fareed also praised him for always being such a knowledgeable guest. I wonder what Fareed Zakaria really thinks? And all of this happened with how many ppm of CO2? Let me guess… we were quite under the “safe” limit. And about 10 months after that we had Michael Dukakis flying around in a helicopter looking at thousand of cars stranded on major roads like 128 because all the exit ramps became blocked at the start of the Blizzard of 1978. The winter of 1976-77 In Chicago was not so bad. It was the following winter, 1978-79, when 82.3 inches of snow fell and shut down O’Hare Airport and the streets didn’t get cleared, period. Cost the Mayor (Bilandic) his job. There’ve been other nasty winter (1966-67, January storm shut down the entire city), but the worst one ever was the Groundhog Day blizzard (2/2/2011) which not only put 4.5 feet of drifting snow on my front porch, but also shut down Lake Shore Drive, stranding dozens of commuters when a flexbus broke down and couldn’t be moved. That was legendary. Good to see your science is settled, that must be a comfort. The current PDO warm cycle has so far been obscured by 2 El Nino cycles (2009/10 and 2015/16) and a weird “The Blob” anomaly in the North Pacific, but all these have ended, so global temps will start showing falling trends from 2019, when the AMO also enters its 30-year cool cycle. Collapsing solar cycles will also add to the coming global cooling. The bitterness of a refuted warmista. I feast on your tears. Yes indeed! This is my thinking as well. In fact I would be surprised if it doesn’t. 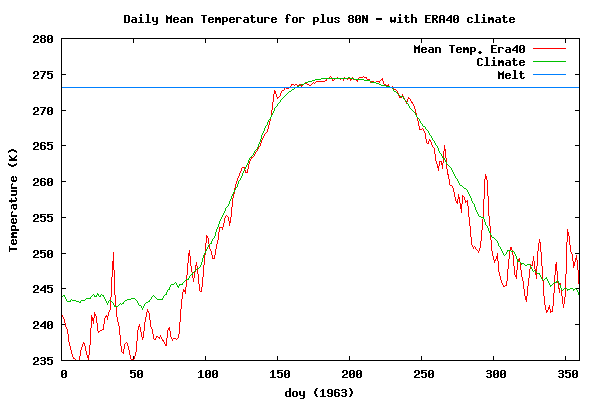 It’s what we see in the historical record this oscillation in climate swings. It seems the only way of keeeping honest score is temperature so if the trend stays paused, or drops in real data consistently over time then the spending on trillions for an ill-conceived threat to humanity is over. I said that long ago. I was rather peed with the science is settled that I said this, all this global warming would be a harbinger of the next glacial age. I remember in the early 70s, worried by the cooling and the next glacial age. 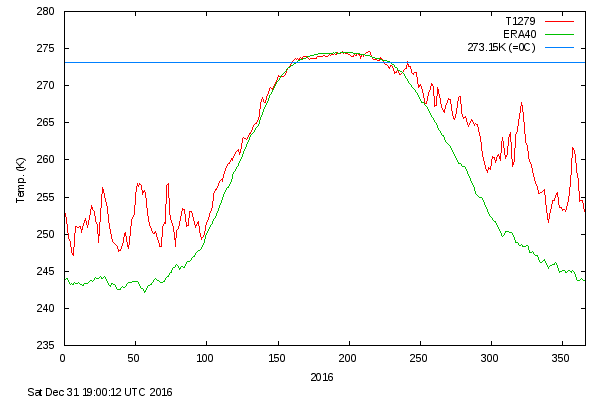 I thought we can spread some dark stuff over the ice in the arctic and north Canada. I imagined planes dropping some dark stuff to decrease the albedo. As you can see, summer temperatures are nearly identical so the lion’s share of the difference in heat loss happens in the dark. buki o sutete, kousan shiro! Drop you weapons and surrender. Stop your whinging and give up your silly ( cataclysmic ) climate claims. Smell the roses before the frosts kill them. just in case my intension was misunderstood…. my prior comment was meant as agreement with you SAMURAI. THROW DOWN YOUR WEAPONS AND SURRENDER, A$$+*#>!!!…. LOL! Towards the end of the last PDO cool cycle (1945~1977), it got so cold some scientists were talking about the “The New Ice Age”, and that was during the strongest 63-year string (1933~1996) of solar cycles in 11,400 years….. The winter of 1947 in UK was the “worst EVAH”. The entire country froze up for all of Jan, Feb & March with temperatures staying below freezing for the entire 3 months. Same in the winter of 1963. Fits right in. Lots of snow in Moscow on their annual VE-Day parade. Apparently, the last time that happened was back in 1922. Lots more snow outside the city centre. They had a VE day parade in 1922? How prescient of the commies! I remember that day well, or actually the day before, I believe it was Mother’s Day 1977 in Buffalo. The cold winds off Lake Erie put some 8 inches of snow on the ground. I went out cross country skiing in the AM with yellow klistervox on my skis, ended up walking back because the snow was melting so fast. By 1 pm it was green again. What was your experience with the Blizzard in January? That had the biggest impact because the cold months before had frozen Lake Erie early and all the snow on the ice blew into Buffalo on the high winds. The massive amount of snow on the ground and on Lake Erie. Before the 1976-77 winter, the National Weather Service’s record for snowfall in any month was 54.2 inches in February 1958. That record was crushed two months in a row, with 60.7 inches in December 1976 and 68.3 in January. The long cold snap. The Buffalo area went 45 days, starting on Dec. 26, 1976, with continuously below-freezing temperatures. The average daily temperatures dipped to 22.0 degrees in December and 13.8 in January, both well below average. An entirely frozen lake. The eastern end of Lake Erie froze on Dec. 14 that season, roughly a month before normal. That blowing snow had to land somewhere, and it created massive drifts, one of the signatures of that blizzard. “There was talk about drifts being so high that in some places it went up to the telephone wires,” recalled Richard K. Sheffield, who was on duty in the National Weather Service office for about the storm’s first 24 hours. Those drifts, estimated by some at 30 to 40 feet high, blocked many people from opening their homes’ entrance doors and allowed some people to walk on packed snowdrifts higher than the roofs of cars. In May of 1977, I had just moved to Marlboro, MA and was still in a motel when the spring storm hit. The trees were well-leafed, and the snow was wet enough to stick, with attendant treefall causing wide-spread power outages, including my motel. Did I forget to mention that I had 3 kids and a wife in tow? Formerly from Florida. With zero winter wear? The next January, I was sitting at my desk at The Mill in Maynard when the snow began to fall at around noon, IIRC. I watched it snow for about an hour then clocked out and headed home on the back roads with a car without snow tires. I made it with little problem. Those who failed to leave early were not so lucky. Route 128 quickly became a snowbound parking lot, reminiscent of the photo above. People abandoned cars and walked to the nearest building, where they stayed for a couple of days. The Governor declared the roads in eastern Mass to be closed for almost a week. The National Guard cleared 128 with fork lifts and flat beds, hauling the abandoned cars to a pier in Boston for storage. Fun Times! A major component of my decision to relocate to the sunbelt. I live thru the May 10, 1990 blizzard in Milwaukee, that was surreal! I remember that May snowfall well. We were remiss is taking our studded snow tires off at the end of winter so the day after this historic snow event, I was driving to a friends house and got pulled over. The officer noticed the studded tires because they do make a distinct sound. At any rate, when he informed me of the law, I couldn’t resist saying, “you have to admit, I was prepared for yesterday”. He was a nice guy, chuckled a bit and reminded me to get them removed and sent me on my way. almost killed myself slipping on deck. That Emmylou album was later, actually (1980). Personally, I’m fond of daffodils dusted with snow. Late enough to be interesting, and the daffodils don’t seem to mind. Down here in the mid latitudes of the Southern Hemisphere (40 South) daffodils can bloom as early as late July in some parts but at my place they pop out in the second week of August, right in the middle of winter, the southern equivalent of Groundhog Day. We rarely ever get snow on the ground at sea level here but back in mid August 2011 we did, & the daffodils were covered. Wish I’d taken a photo of it now! I remember a cold spell in the mid-1970s in Central Virginia. It blew through with not much snow, but enough wet on the ground to turn streets in the Hampton Roads area into ice rinks. I had to wait until mid-day next day for the interstate to be safe for me to return to Durham, NC, where I lived at the time. The James River froze over up to Richmond for weeks; people rapidly found out how much we depended on river traffic to deliver goods to Richmond. Meanwhile, back in Durham (and in Central Virginia, too), the temperature didn’t get UP to freezing for a month. It wasn’t in April or May, but it was unusual, even for winter in the “Sunny South.” Right in the middle of the “Coming Ice Age” (according to Time Magazine). So I have a hard time getting exercised about “Global Warming.” I’m much more concerned about the present “cue ball” sun. Cold kills. That was during the infamous late 70s La Nina. At the time we here on the Left Coast were chanting the mantra “if it’s yellow let it mellow, if it’s brown flush it down.” Along with the terrible drought we had a number of cold events during the winters and springs. Only time I ever saw sticking snow in the Bay Area flats was a little over a year prior – Feb 1976. We were all late for school that morning. Too many snowball fights for us tweeners to resist. The Chesapeake Bay largely froze over the winter of 1976-77. I remember ice skating a mile or so out into the bay from the Annapolis area. Maybe it wasn’t quite that far…but in the sheltered coves ice was almost 3 feet thick! Ric, I don’t know if this is the same event, but I remember a savage Ice storm on the 10th of May, 1980 or ’81 – I’m pretty sure it was ’80 (?). I was living a few miles west of Hanscom Field, Bedford, MA. If it is the same event, I’m getting senile. I used to worry about Alzheimer’s, but I can’t remember why. I tried to share this story on Facebook over the last couple of hours and keep getting a “We are having trouble with the URL you provided, try again later. Still will not let me post it? Well, this turns out to have been a timely post. The Concord Monitor reported that Mount Washington (a long way from the town) had 33″ at the summit, nearly three times its average May snowfall. That storm was on the 13th to the 15th. Tomorrow, the 18th, we may set a record high temperature in Concord NH of over 90F! Concord NH did set a record of 93° for the 17th that year. Today is the 17th, and we reached at least 92°, likely no record today. However, tomorrow’s record is only 90°, set in 1906, and the forecast is for 94°. I like to say There’s nothing like spring in New England.